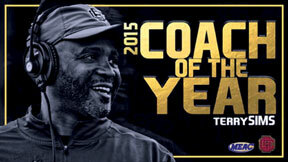 Bethune-Cookman University’s (B-CU) first-year head coach Terry Sims was honored as the Mid-Eastern Athletic Conference (MEAC) Coach of the Year, announced Monday afternoon by the league office in Norfolk, Vir. In addition, five B-CU student-athletes were named to the all-conference first team, while another five were selected to the second and third team, respectfully. Sims, having taken over the reins of the Wildcats program on Dec. 22, 2014, guided the Wildcats to a share of the MEAC title in 2015, including a 9-2 overall finish and 7-1 mark in league play. For the Maroon and Gold, the title represented the school’s fourth consecutive (eighth overall), matching South Carolina State (1980-83) for the second-longest streak in MEAC history. The Wildcats were victorious over in-state rival Florida A&M, 35-14 in the annual Florida Blue Florida Classic to secure their stake in the conference title. B-CU led the MEAC in several statistical categories, including scoring offense (31.4 avg/g), total offense (445.0 avg/g), rushing offense (191.8 yds./g), pass offense (253.2 avg/g), and pass efficiency (164.1 efficiency). The Cats also hold top 10 positions in the FCS in passing yards per completion (6th) and team passing efficiency (3rd). B-CU entered the STATS FCS Top 25 poll in the final ranking of the season (25th) and have slowly climbed the FCS Coaches Poll to reach No. 21 following the last game of the regular season. Also representing Bethune-Cookman on the All-MEAC First team was quarterback Quentin Williams (Tampa, Fla.), wide receiver Jawill Davis (Miami, Fla.), offensive lineman Dariusz Bladek (Kissimmee, Fla.), line-backer Robert Way (Belle Glade, Fla.) and defensive back Marquis Drayton (Fort Lauderdale, Fla.). Representing the Cats on the All-MEAC Second Team was running back Anthony Jordan (Atlanta, Ga.), tight end Ja-Quan Lumas (Orlando, Fla.) and linebacker Donald Smith (Tampa, Fla.). On the third team was running back Michael D. Jones (Sarasota, Fla.) and junior punter Jonathan Cagle (Pensacola, Fla.).